Physical activity and sedentary living are important public health issues. Several studies have revealed links between various features of the built environment and physical activity. 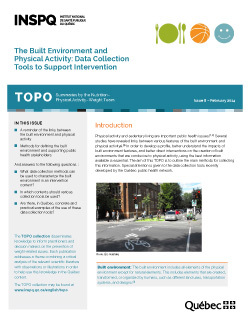 In order to develop a profile, better understand the impacts of built environment features, and better direct interventions on the creation of built environments that are conducive to physical activity, using the best information available is essential. The aim of this TOPO is to outline the main methods for collecting this information. Special attention is given to the data collection tools recently developed by the Québec public health network. What data collection methods can be used to characterize the built environment in an intervention context? In which contexts should various collection tools be used?